As a two-time Team USA Olympian and Olympic finalist, Sarah has a passion for motivating and inspiring people to become the best version of themselves. 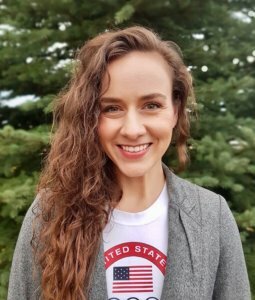 In addition to her athletic career, her credentials as a Registered Dietitian, Licensed Nutritionist, and an MBA specializing in Healthcare Management enable her to help others achieve their goals. She has coached over one thousand individuals, focusing on weight loss, improved sports performance, diabetes prevention, heart health, healthy aging, smoking cessation, and additional healthy lifestyle and performance goals. For National Nutrition Month, Shaklee Pure Performance Team Dietitian/Nutritionist Sarah Elijah Scherer talks about some foods that are deal breakers for her and why? Sugar-coated breakfast cereal: Beginning your day with any portion of high-sugar cereal will start you on a blood sugar roller coaster that always ends in a crash. This will lead to feeling tired, maybe even moody, and still hungry. Instead, try whole grain cereal and top with fruit. All-in-one packaged meals: These are high in salt and fat and heavy processing has stripped nutrients from the ingredients. Also, these meals often have preservatives and chemicals I don’t want in my body. If you choose these meals for the convenience, an alternative is to batch cook a meal with 2–3 extra portions. Freeze the extra portions as individual meals for the next time you need a quick meal. Processed cheese and sauces: An example of this is cheese in a can. This “cheese” isn’t cheese at all, plain and simple. Processed cheeses are high in salt and saturated fat. Instead, choose a low-fat string or hard block cheese and limit to a thumb-sized portion.